This is a guest post for Silent London by Chris Edwards, who writes the Silent Volume blog. It’s better among fellow fans. We all skirt the periphery together. We talk about the great silent classics, arguing their places in the canon; we discuss the latest restoration, the newest score, the anticipated Criterion release date, or what a crime it is that there isn’t one. We hear about an obscure gem, and then can’t wait to see it. But it is possible to be marginalised even by silent film aficionados. I have felt it. 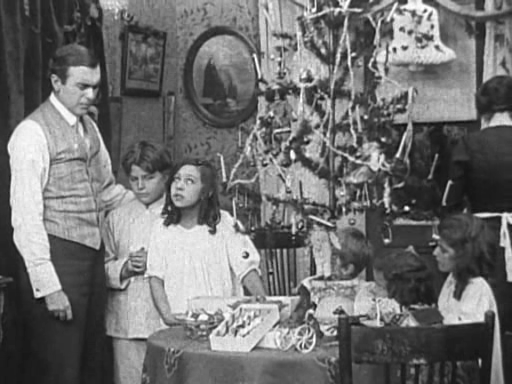 Because, while I love all silent film, I hold a particular affection for the very earliest stuff: films made from the late-19th century to about 1913 or so. Films that many silent films fans have no use for. Well, that’s harsh. And it’s not quite what I mean. Many silent film fans do love these old curios; it’s just that few of us love them for their artistic merit. Rarely do we hear anyone discuss a director from this period as an artist, or the works themselves as having any profundity. Brief, stiff, and broadly acted, these ancient movies are valued primarily as museum pieces. They’re notches on a scale of development from proto-film experiments through to “modern” film as we have come to recognise it. They’re assessed in terms of what they lack. And I’m telling you, we’re missing out. Why do I think that? Because some of these films have left me with ideas to ponder. Not just ideas about the history of film or the paucity of technique early filmmakers possessed, but real ideas. Rarely do they convey these concepts literally. Rather, they express them through their unique mashing up of the abstract and the verisimilar – the theatrical and the cinematic, the fake and the real – whatever you want to call it. They say things in their own way. I don’t have space to describe too many examples. But I will tell you about some of the features of these films which intrigue me. Though they’re often dismissed as weaknesses, these features can also, in the hands of an artist, become the means by which early films convey meaning. One feature is flatness. Much as a stage can only push back so far, these films, too, exist mostly in a middle distance. Vistas are, for the most part, backdrops, and not very convincing ones. Almost all shots are medium shots. This flatness is coupled with a strong sense of boundaries—top and bottom, and especially stage-right and -left. This is your space, viewer. Yes, the result feels old-fashioned. But flatness and boundaries aren’t simply limitations. They can create very interesting effects. When you’re conscious of a scene as a flat plane with defined boundaries, and the actors are somewhat depersonalised by medium shots, you start looking at set, action, and boundaries as a unified object. As you would look at a painting. Director Bannister Merwin pays close attention to the two halves of his frame … he splits the lower façade of the house exactly in two, dividing the centre of the frame with a porch pillar standing between the two front doors. The rear of the house has almost-identical doors as well, with a tall railing spindle marking the midpoint between them. Gilton [the miser] almost never crosses the midpoint … We’re not to see the halves of the house as parts of a literal object, but rather, as the world of sin and the world of righteousness; compartmentalised, but close. The pillar and spindle were not only part of the scene, but part of the frame, separating the characters visually to make Merwin’s point. In this way, A Christmas Accident resembles a medieval painting more than a modern film. You can do a lot with a good set. And you’ll typically do more if you don’t have the luxury of multiple camera angles, close-ups and complex tricks. In terms of technical excellence and versatility, Georges Méliès’ sets have probably never been equalled. They’re seamless collections of pieces, each sliding into frame, perfectly timed, layer upon layer. 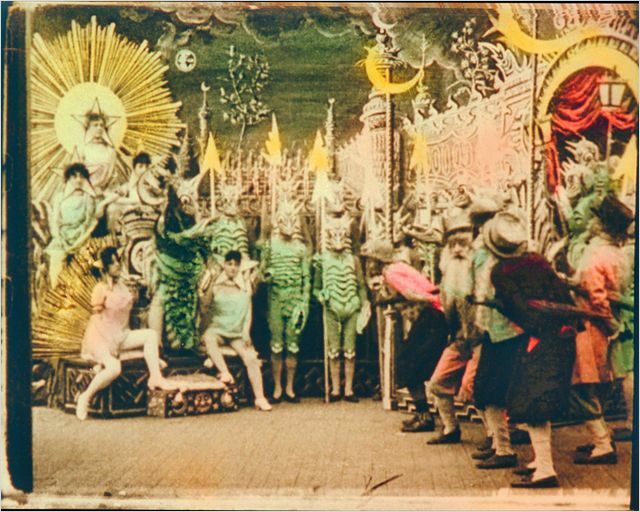 They embed Méliès’ often-frantic actors in a fantastical world, pulsing with action. This world bears no more resemblance to reality than a comic strip does, mind you. But that’s a good thing. Early directors’ near-indifference to aesthetic consistency is what I love most about them. I adore scenes of time-pressed people consulting clocks with painted-on hands; struggling to lift two-dimensional vases, and on and on. On stage, this kind of thing is a practical necessity, but in a film, it’s a choice. It’s also a declaration of faith in us, as viewers. We’re people capable of merging these disparate levels of reality into one. Anyway, what’s so “real” about the environments we wander through every day – or the ones we see in most modern, live-action movies? Art and trickery is everywhere. These early films were just blunter about showing it. [Mombi the witch] captures Gloria [niece of the King of Oz] and ties her to pillar. With an incantation she summons three other witches … and combines their powers with her own to create a cauldron-full of magic potion. Then … Mombi ladles the stuff over Gloria’s blouse. Mombi now cups her empty hand just below Gloria’s breasts. A heart (a stuffed heart in the shape of a real one) appears in her hand, and ices over. The now-frozen heart disappears, and Gloria’s capacity for love goes with it. Wikipedia describes Mombi “pulling out her heart,” but that’s wrong. Nothing is pulled from Gloria’s chest. Filmed in close-up, this scene represents a total dismissal of the boundary between literal and abstract – they co-exist in one cinematic reality, with limitless story-telling potential. I wish more films were like this. The closest modern comparison I can think of would be Who Framed Roger Rabbit (1988), but even in that case, the human actors acknowledge the physical differences between themselves and the Toons. In His Majesty, the differences are forgotten. Look at these old, old films, and you can see the potential of the medium. Every hesitant movement of the camera inward, every subtle gesture chosen by an actor, pointed the way forward. But if you see these movies only as first steps to something truly great, you’ll be missing a lot. I say some of them are truly great on their own – in their era, in ours, and in the future. Fascinating, illuminating piece. I am *so* glad I stumbled across this site. Thanks. I say ‘stumbled’; I should actually namecheck @britishpictures for the signpost.